While investigating the issue and some Googling by my colleague Patrick de Ritter we found that we where not alone. Beside the small note Dan Brinkman already wrote about this issue there is also a nice thread about the issue on the Citrix Discussions forum. To clarify this issue I decided to write an article about this issue. Select the check box at Prevent App Nap check box to prevent the application from hibernating. 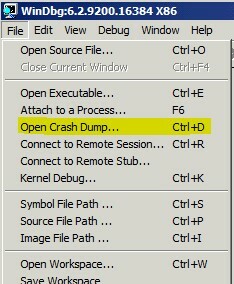 Because the Citrix Receiver only handles the connection to StoreFront, you’ll also need to set this for the Citrix Viewer (previously known as the XenApp Viewer). 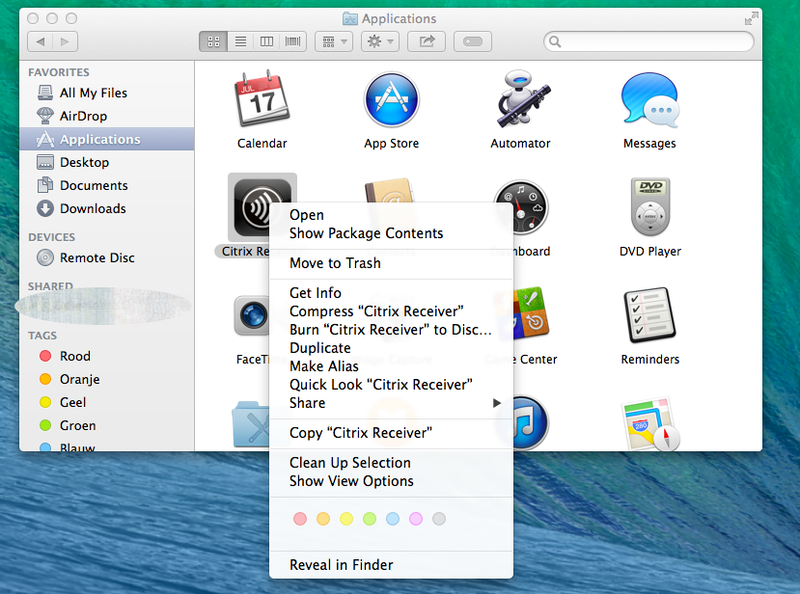 Use Command + I (or right-click the app, then click Get Info) to open the Get Info window. 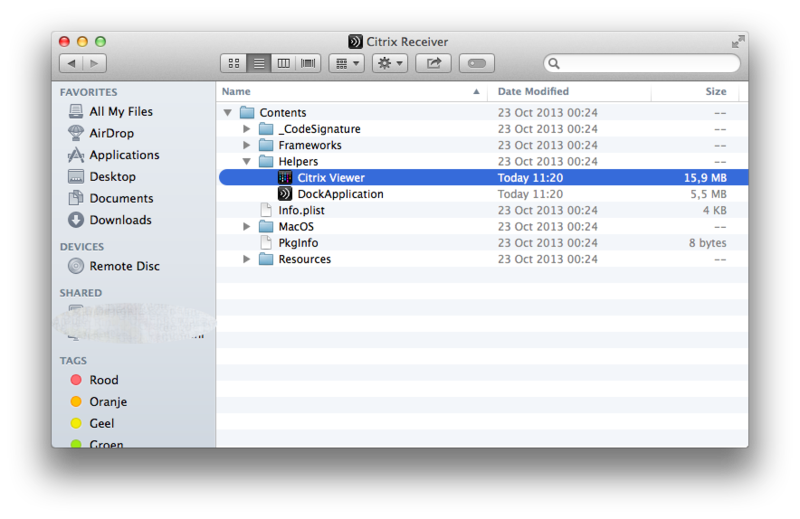 Open the Applications folder and find the Citrix Receiver. To do this, right-click the Citrix Receiver app and select Show Package Contents. 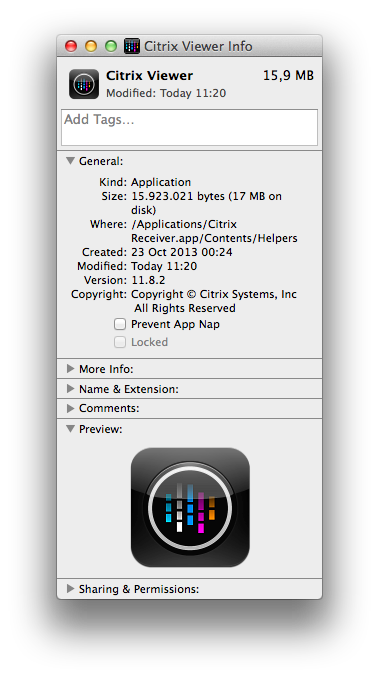 Navigate to the Helpers folder, under the Contents folder, and use Command + I (or right-click the app, then click Get Info) to open the Get Info window for Citrix Viewer. 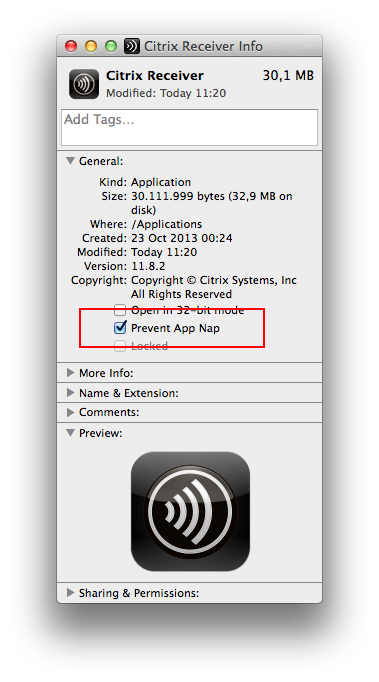 Again, select the check box at Prevent App Nap to prevent the application from hibernating. After the user logs on again (because of the services running in the background), the application will never hibernate again for this user. That’s right, these settings are for the logged in user only. While designing a Citrix XenDesktop 7.5 environment I ran across the Citrix Storefront 2.x KEYWORDS feature. For reference I want to share a summary of the KEYWORDS values known to me. Keywords are ways to enhance the user experience in a Citrix XenApp or XenDesktop environment. They enable the admin to steer the behavior of the published apps or desktops visible to the user in the different Citrix Receivers or through the Citrix Worx app in a XenMobile implementation. This, for example, enables the organisation to automatically make an app or desktop visible to a user when they open the receiver for the first time. Automatic subscription to an app or desktop for a user. The app or desktop will have an automatic subscription in the Citrix Receiver of a user. F.e. If we publish a desktop and want that desktop to be visible to a new end user without requiring any action on the user side. If you want the app or desktop to be sticky please read this blog by Citrix. 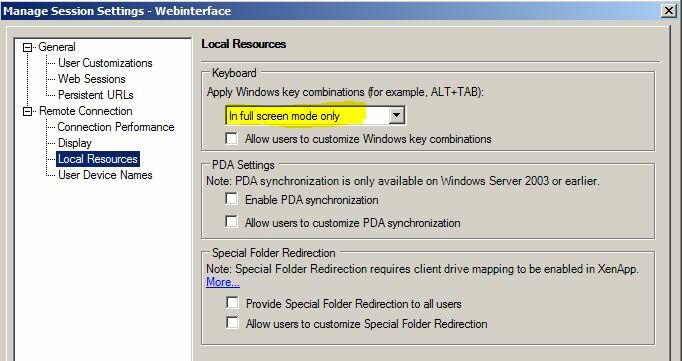 This option enables the admin to put certain apps or desktops in a feature list which will be visible in theCitrix Receiver. Especially when you have many apps and you want to highlight certain apps this is a convenient feature. Opposite to the keyword Primary. It is possible to use multiple KEYWORDS per Desktop or Application. This can be done by specifying more than one keyword in the published application or dektop. So below a quick HOWTO add KEYWORDS to a Citrix Published Desktop or a Citrix published app on XenApp or XenDesktop. 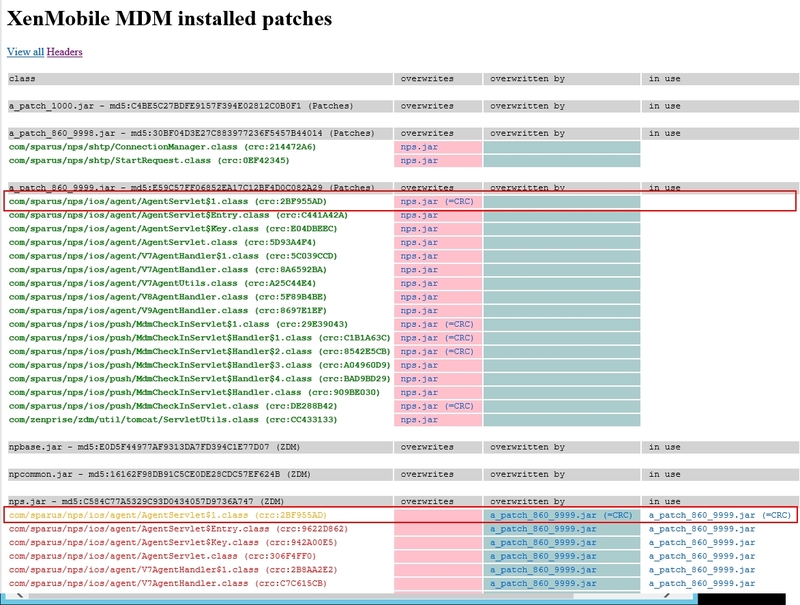 Recently a Citrix XenMobile emergency patch for the Citrix Device Manager appeared. To apply the fix I needed to find out on how to patch the XenMobile Device Manager. I also wanted to know how I could check if the patch was applied and if I could see which patches where already applied. (This article is based on the readme.docx found in the patch zipfile and a Citrix blog ). As you can see al lot of files have been overwritten and since the console is available and I can enroll/manage a device! Upgrade/patch succeeded. 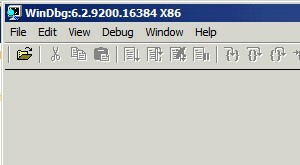 Of course I could check the version number in the XenMobile Device Manager Console, about tab. Recent customer (Gemeenschappelijk Diensten Centrum in Zoetermeer) requirements brought us to the world of Microsoft Lync 2013 and Citrix Receiver 4.x. 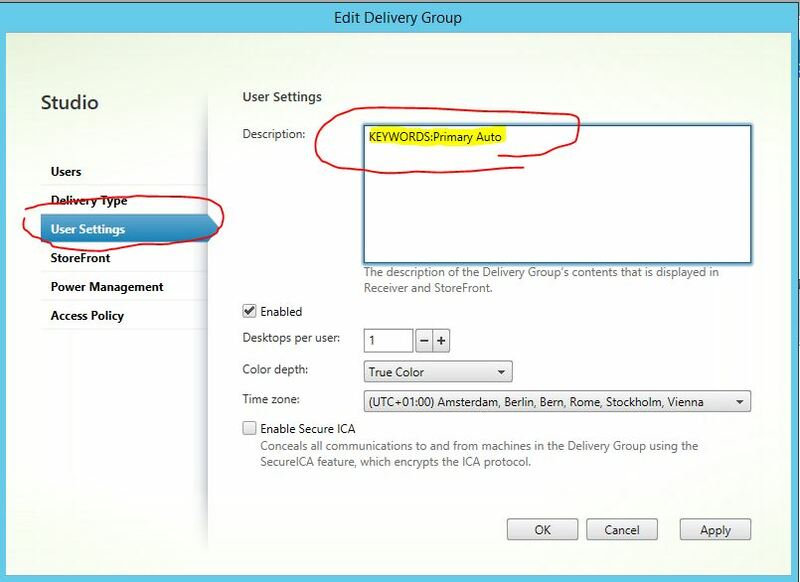 They wanted Lync 2013 in their current VDI environment with support for automatic location detection and voice support. The Current VDI deployment was based on XenApp and Receiver 3.4. This receiver has no support for Lync 2013 and a logical step was to move to Receiver 4.x which has support for Lync 2013 (CTX138408). The access devices used in this deployment are based on Windows 7 but I have also tested this setup on Windows 8.1. After the setup Microsoft Lync 2013 will work like a charm (Microsoft Lync 2013 becomes location aware based on the device location, the local audio device and webcam become available in the Lync client). Now the issue arrises: When we hit a Windows key combination like the windows key it brings up the local start menu (or tiles menu on Windows 8) and the start menu on the published desktop. When the Lync 2013 client is not installed everything works as expected. When the Lync 2013 client is installed the Windows key combinations break! 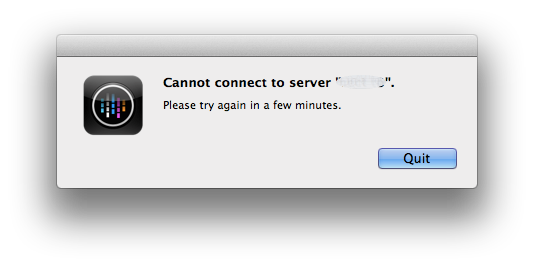 Citrix acknowlegded that this is a bug and when I get a fix I will update this post. Note: the issues does not appear when the desktop viewer is used! Update (March 2014): Microsoft confirmed to Citrix support that this is a Lync issue and this will be solved in a patch following the SP1 release for Microsoft Office 2013 (released feb 2014). In the start menu browse to “Windows Kits\Debugging Tools for Windows” and choose the WinDbg.exe applicable for your platform x86 or x64. Recently I needed to check the Xenapp patch level. I was used to check the ‘Programs and features’ in Windows. At least that was my first place to look for a version and installed patches. Unfortunately patches are not listed and I needed a simple workaround to find out what patches are installed. 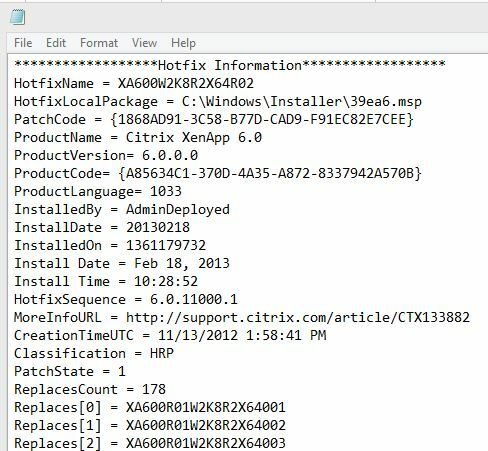 The solution was found in the Citrix patch utility and by executing the following command you get a list of all installed patches, product version, all replaced hotfixes and more. When researching and reading about the Citrix Excalibur tech preview I came across a lot of resources. I listed these resources for my own convenience and for you to profit from.. The sources can be downloaded when you have a myCitrix account.